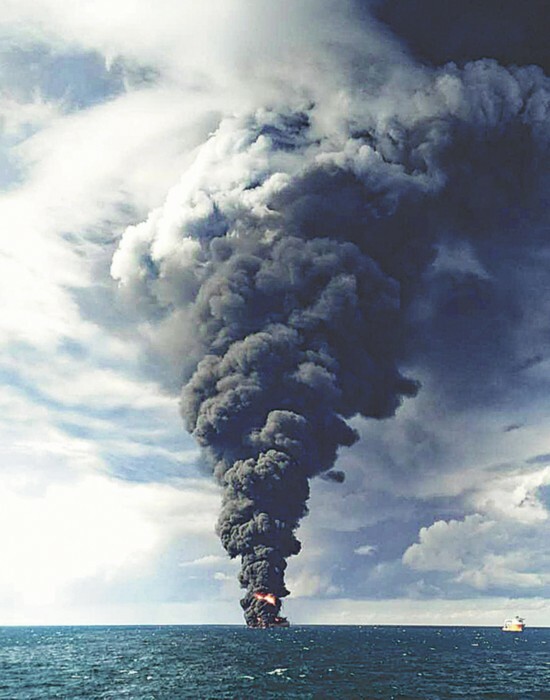 The Panama-registered oil tanker Sanchi exploded and sank in the East China Sea on Sunday afternoon, eight days after it collided with a cargo vessel and burst into flames. China's ocean administration is busy monitoring its subsequent environmental impact. Of the 32 crew members, just three bodies had been recovered by Sunday, officials said. A large amount of oil from the spill continued to burn on the sea's surface, affecting the environment, the State Oceanic Administration said on Sunday evening. The consistency of petroleum material in the seawater in the area was up to 25 micrograms per liter on Saturday before the ship sank, the administration said. It did not provide a context as to whether that was serious or not. Officers planned to intensify monitoring and assess its environmental impact, the administration said. The Iranian ship sank about 4:45 pm, 151 nautical miles from the collision site, according to the Ministry of Transport. A 10-square-kilometer oil belt could be observed visually, a report by China Central Television said. The Sanchi, carrying 136,000 metric tons of highly flammable condensate oil, or natural gas liquids, collided with a Hong Kong-registered cargo ship about 8 pm on Jan 6 some 160 nautical miles east of Shanghai. 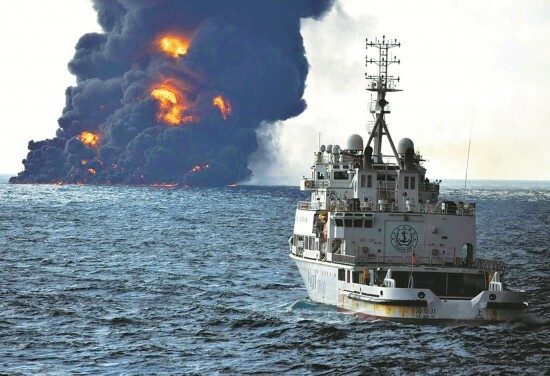 Zhang Yong, an engineer from the administration, told CCTV that the condensate, a type of ultralight oil, has comparatively less effect in damaging the ocean than other crude oil products because of its high volatility. The Sanchi had 32 crew members — 30 Iranians and two Bangladeshis. As of Sunday, three bodies of the missing had been recovered — two were found by a salvage team on Saturday and one was discovered at the collision site on Jan 8, according to the ministry. The cargo ship's 21 crew members were rescued. On Saturday, Foreign Minister Wang Yi told his Iranian counterpart Mohammad Javad Zarif over the phone that "China will continue to carry out 100 percent effort as long as 1 percent hope remains". Zarif expressed gratitude for China's efforts on rescuing the Iranian sailors, and said Iran is willing to keep close communication and cooperation with China on the matter. On Saturday morning, four rescuers were placed on the back of the Sanchi by a crane. They found two bodies on the deck of a lifeboat. The ship's "black box" had also been retrieved, according to the ministry release. Thirteen vessels — 10 Chinese, two Japanese and one from South Korea — are participating in the search and rescue operation, including searching for victims, contamination control and putting out the fire.